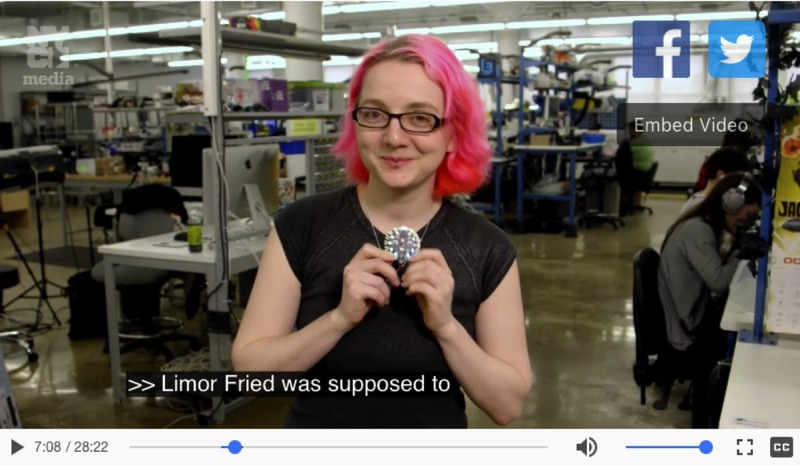 Her Big Idea, featuring Limor Fried @adafruit @MadeinNY #MadeInNY @nycgov @nyc_media « Adafruit Industries – Makers, hackers, artists, designers and engineers! Direct link to video is HERE! 7 minute mark! Hit show “Her Big Idea” returns for Season 2 tomorrow at 8:30pm! Catch up on S1 on her-big-idea. Tonight’s episode features our Ladyada. BoxUp founder Lily Tran, Jill Stuart International founder Jill Stuart, Girls Who Code founder Reshma Saujani and Peeled Snacks founder Noha Waibsnaider. June Jacobs Spa Collection founder June Jacobs, Baked by Melissa founder Melissa Ben-Ishay, Brooklyn Soda Works co-founder Caroline Mak and Gwynnie Bee founder Christine Hunsicker. Laura Geller New York founder Laura Geller, DOUGH Doughnuts founder Fany Gerson, Yumi Kim founder Kim Phan and Happy Family founder Shazi Visram. Carol’s Daughter founder Lisa Price, Fishs Eddy co-founder Julie Gaines, NEST Fragrances founder Laura Slatkin and Runway of Dreams founder Mindy Scheier. Sarabeth’s founder and baker Sarabeth Levine. Manhattan Portage owner Su Hwei Lin. Carly Strife, co-founder of the BarkBox. Produced by NYC Media, this half hour show features inspiring stories from successful women who transformed an idea into a thriving business in New York City. “Her Big Idea,” the hit show profiling successful women entrepreneurs in New York City, returns for a second season on November 6 at 8:30 p.m., produced by NYC Media, the official broadcast network of the City of New York. The groundbreaking program highlights achievements of some of New York’s most inspiring businesswomen, ones who turned a great idea into a thriving enterprise from the ground up. New York Cityleads the nation in the number of women entrepreneurs, giving the half-hour show airing on NYC Media’s flagship channel NYC Life plenty of subjects. The debut episode of the new season features interviews with makeup maven Trish McEvoy, Adafruit Industries founder Limor Fried, Harlem Brewing Company founder Celeste Beatty and Hopscotch Technologies co-founder Jocelyn Levitt. Her Big Idea was created as part of a groundbreaking series of initiatives announced by the Mayor’s Office of Media and Entertainment last year, targeting the underrepresentation of women in the film and television industries both on and off the camera. These initiatives, which also include a $5 million women media fund and a women’s screenwriting contest, mark the first time a municipal entity has taken on gender inequity in these fields. Other elements of these initiatives include pitch workshops for women filmmakers, a film financing conference connecting women filmmakers with funding for their projects, and a report analyzing the gender imbalance of directors in the film industry. The second season of Her Big Idea will feature a special episode dedicated to WE NYC (Women Entrepreneurs NYC)mentors. WE NYC is an initiative based out of the NYC Department of Small Business Services that is dedicated to helping women start and grow their businesses, connecting them with the resources, education and community they need to thrive. Each of the women featured in this episode are successful business owners who also share their expertise as mentors, as part of WE NYC’s mentorship program. The Mayor’s Office of Media and Entertainment encompasses the key economic and creative sectors of film, TV, theater, music, advertising, publishing, digital content and real estate as it relates to these industries. In total, these sectors account for over 305,000 jobs, and an economic output of $104 billion. The office promotes New York City as a thriving center of creativity, issuing permits for productions filming on public property, and facilitating production throughout the five boroughs. It also oversees NYC Media, the largest municipal broadcasting entity in the country including five TV channels and an FM radio station with a reach of 18 million viewers in the greater metropolitan area.